New Zealand are considered a better limited overs side than a Test side, and their performance on the tour of India proves why this is the case. Unlike in the Tests, the visitors showed gumption in the five-match ODI series and won two matches. A massive 190-run win in the final ODI in Vishakhapatnam helped the hosts clinch the series. Here are a few statistical landmarks and milestones achieved during this series. Amit Mishra became the fastest Indian spinner to take 50 wickets in ODIs. He also became the fourth fastest Indian overall to the 50-wicket mark in ODI cricket. The only Indians who have achieved the milestone quicker than Amit Mishra are Ajit Agarkar (23), Mohammad Shami (29) and Irfan Pathan (31). However, the Delhi leg-spinner took 4,936 days to achieve this milestone, which is the most by any bowler in ODI cricket. 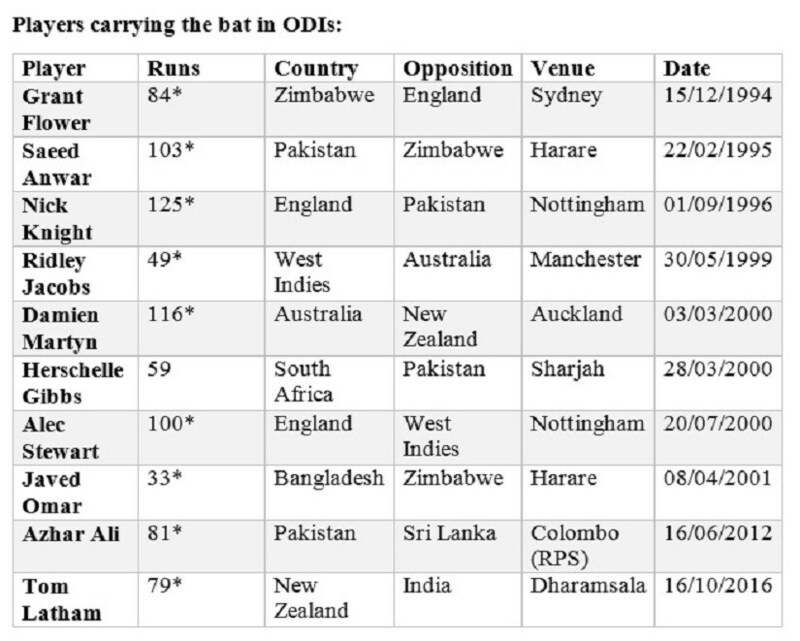 Tom Latham became the 10th cricketer to carry his bat through an ODI innings, and the first from New Zealand. He also became the first player to carry his bat against India in ODIs. Tim Southee became the first New Zealand player to score a half-century batting at No 10 in ODIs. The previous highest was Kyle Mills' unbeaten 44 scored against Australia in Sydney in 2004. 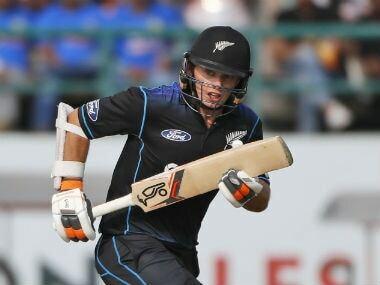 Southee also became the eighth New Zealander to score a half-century in his 100th ODI match. The other seven before him are Nathan Astle, Chris Cairns, Martin Crowe, Richard Hadlee, Kyle Mills, Ken Rutherford and Scott Styris. India's six-wicket win was their 108th win under MS Dhoni's captaincy in ODI cricket. Dhoni has now become the second most successful captain of all time, going past Allan Border's tally of 107 wins (from 178 ODIs) to move into second place. Ricky Ponting (with 165 wins from 208 ODIs) is the all-time leader of this table. Hardik Pandya's figures of 3/31 in his debut ODI match are the fourth best by an Indian bowler on debut. He also received the man-of-the-match award, becoming just the fourth Indian to achieve the honour on debut. The others to achieve it are Sandeep Patil, Mohit Sharma and KL Rahul. The second match, played in New Delhi, was India's 19th ODI played at the Feroz Shah Kotla, the joint highest for any Indian venue. India has also played 19 ODIs at Kolkata's Eden Gardens and the M Chinnaswamy Stadium in Bangalore. Rohit Sharma played his 150th ODI, becoming the 19th Indian cricketer to achieve the landmark. However, he could only manage 15 runs in the match. The highest score by an Indian player in his 150th ODI was the 107 scored by MS Dhoni, against Sri Lanka in Nagpur in 2009. Kane Williamson scored 118 runs to lead his side to a series levelling win. This is the highest score by a New Zealand captain against India in an ODI match. He went past Glenn Turner's record of 114 runs, which he scored against India at Manchester in 1975. 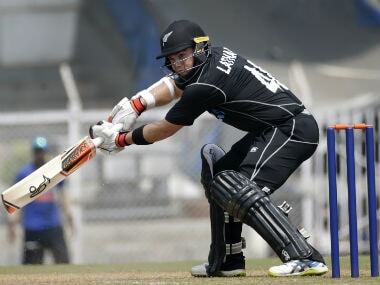 The only other New Zealand captain to have scored a century against India was Kane Rutherford (108 in Vadodara in 1994). India lost this ODI match by six runs, and became the first team to lose 400 ODIs. This was also New Zealand's first win against India in India in ODIs in 13 years. The last time they did so was at Cuttack in 2003. MS Dhoni became the third wicket-keeper to score 9,000 runs in ODIs; Kumar Sangakkara and Adam Gilchrist are the only others to do it. Dhoni reached the milestone in his 244th inning, thereby becoming the fastest to the mark, beating Sangakkara's record of 252 innings by eight. Dhoni also became the first cricketer to get to 9,000 runs in ODIs with an average of above 50. Jacques Kallis, who did so with an average of 45.69, was the previous best. Dhoni, who hit a sensational 80 in the third ODI, also went past Sachin Tendulkar's record of having hit the most sixes by an Indian in ODIs, getting three maximums. Tendulkar had hit 195 sixes from 463 ODIs, but Dhoni has now hit 197 from 246 ODIs. He is currently at the fifth place in the all-time list, which Pakistan's Shahid Afridi leads with 351 sixes. Dhoni also broke the record of hitting most sixes in ODIs as captain, eclipsing Ricky Ponting's tally of 123 sixes from 230 ODIs. Dhoni has hit 126 sixes as captain from 199 ODIs, which is the most in the world. Virat Kohli has now scored 14 ODI centuries in successful run-chases, which is the joint highest by any player in ODI cricket. By scoring his unbeaten 154 in the third ODI at Mohali, he equalled Sachin Tendulkar's record. He has now scored 16 hundreds in ODIs while chasing, which is the second highest by any player after Sachin Tendulkar (17). Overall, Kohli has scored 26 hundreds in ODIs, and only three players are ahead of him in that list. Virat Kohli has scored 3,514 runs in run-chases in ODIs at an average of 90.10, which is the most by any player who has scored more than 2,500 runs ODIs while batting second. Kohli has scored 29 half-centuries while batting second in ODIs from 59 innings. Kohli also became the fastest player to score 3,000 runs in home ODIs, eclipsing Sourav Ganguly's record of 3,000 ODI runs from 70 innings at home. Kohli achieved the milestone in his 63rd inning. MS Dhoni became the first wicketkeeper to complete 150 stumpings in international cricket, when he stumped Ross Taylor off Amit Mishra's bowling. Kumar Sangakkara is at second place with 139 stumpings. Martin Guptill won his 24th man-of-the-match award in international cricket for an outstanding performance with the bat. The Kiwi opener is now the third best when it comes to man-of-the-match awards in New Zealand cricket. Only Nathan Astle (26) and Daniel Vettori (25) are ahead of him in that list. This was the first time India has lost an ODI match in Ranchi. Before this match, they had played two matches at this venue and had won both while chasing; one against England in 2013 by seven wickets, and the other against Sri Lanka in 2013, which they won by three wickets. Amit Mishra took 15 wickets in this series, most by any bowler against New Zealand in a five-match ODI series. Mishra's 15-wicket haul is also the second best by an Indian bowler in a five-match ODI series. New Zealand were bowled out in 23.1 overs in the final ODI; it was their shortest ODI innings in which they lost all 10 wickets. Their previous lowest was 24.4 overs, against Pakistan in Singapore in 2000. Their total of 79 was also their fifth-lowest in ODIs and lowest against India. Indian spinners took 26 wickets in this series, the most the country's tweakers have managed in a five-match ODI series. They have taken 24 wickets three times before in five-match ODI tournaments before this, against South Africa in 2000, New Zealand in 2010 and Zimbabwe in 2013 respectively. Virat Kohli scored 358 runs in this series against New Zealand, the fourth time he has scored more than 300 runs in a bilateral ODI series, also the joint highest by any player. Rahul Dravid and Quinton de Kock have also scored 300-plus runs in four bilateral ODI tours each. Kohli's 358 is also the second highest by any batsman in a bilateral ODI series between India and New Zealand. India won the fifth ODI by 190 runs, which was the second highest margin of victory for them against a Test playing nation. Their highest margin is of 200 runs, when they beat Bangladesh at Dhaka in 2003. Overall, this was India's fourth largest victory in-terms of runs in ODIs.